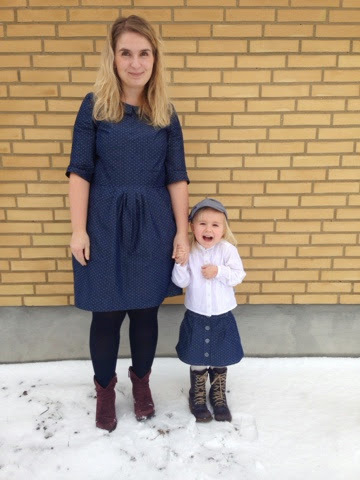 I'm officially not a fan of mother-daughter outfits, but I make them all the time anyway - my excuse is to get good use of all the fabric - but secretly, I think it's cute too. Surely I'll never admit this to your face. This is a frankenpattern - a pattern made from hacking several patterns together and then add a little selfdrafted feature as well. 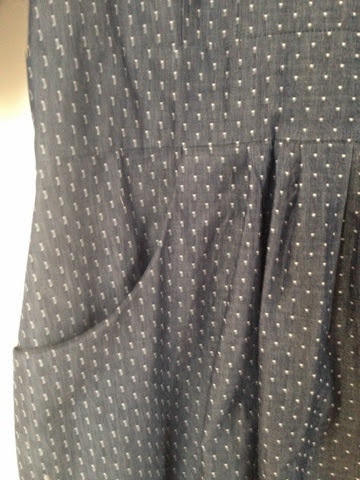 And the fabric - oh the fabric - this is a Robert Kaufman chambray with tiny dots. This is the best chambray (and the most pricy) I've come across. It's lightweigt, so soft and has a very tight weave. Pure luxury and still quite practical with small sticky fingers nearby. 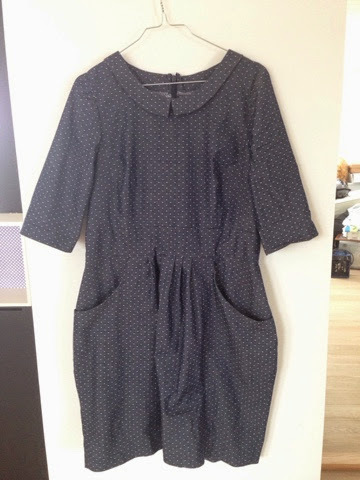 I bought the Mortmain Dress by Gather and was hoping for a go to classic dress and it sure is - it just doesn't fit me. I made a muslin of the bodice and sleeves and couldn't fit my arms into the sleeves - wtf? The back of the dress featured a fabric hunch back and this was just not any good. What to do? 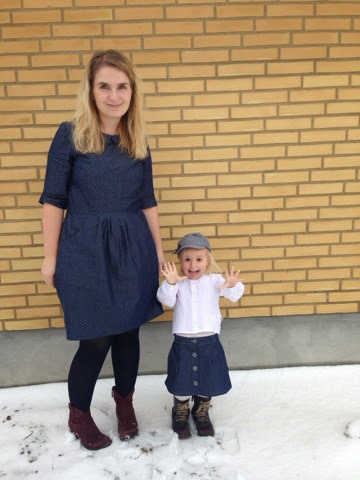 I used the sleeves from Pattern Runways Coffee date dress and redrafted the armscye. I pinched all the weird extra fabric out of the bodice. Then I looked at the skirt part and decided I actually liked the skirt from the Coffee date dress better... To recap - the only thing I acutally used form the Mortmain Dress was a heavily modified bodice! To add a Little personal touch, I drafted a tiny peter pan collar. I used a neat tutorial I found online but now I can't find it again. Essentially you use the bodice neckline but you make it 2 cm smaller on the outer shoulderline. 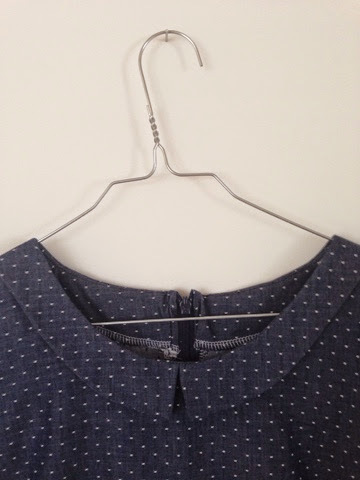 This makes the collar stay nice and flat. I think it worked quite well. My daughter was in a very good mood when we took these Photos - she couldn't stop trying to make us laugh. She is wearing a really cute skirt made from the remnants from my dress. 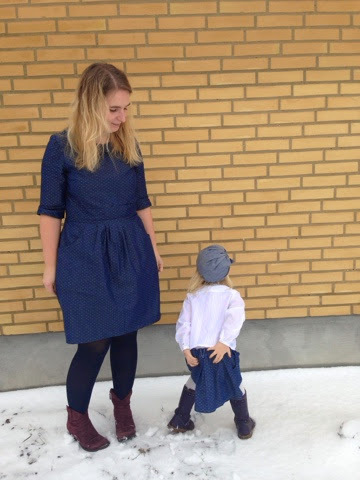 The pattern is the Ayshe Skirt from Figgy's. The skirt was a real pleasure to make. It has small beltloops, buttondown front, pockets and a real practical hidden elastic in the back waistband. The photoshoot has to end now - she is cracking me up! 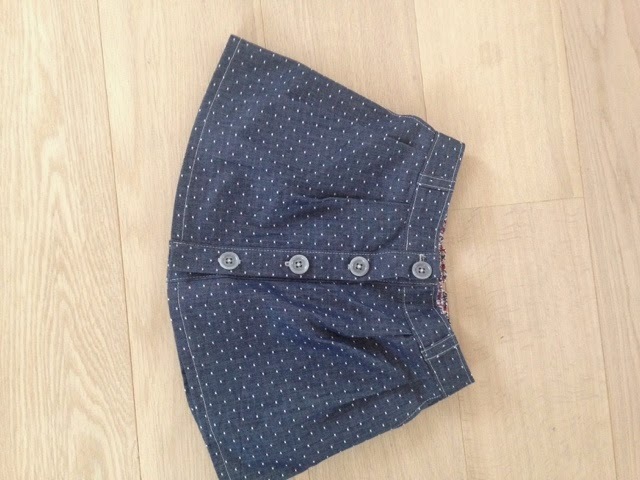 I used a scrap of Liberty on the inside waistband - just to make it extra pretty. Super fin kjole! Den sidder rigtig godt på dig. 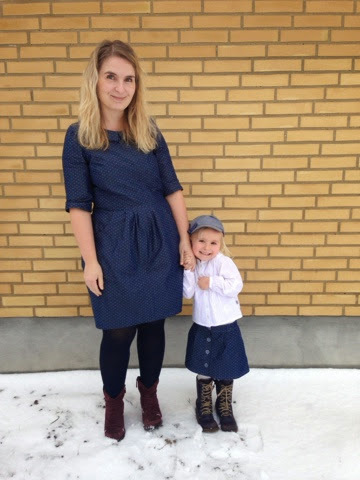 Hvor er I søde :-) Og det er virkelig en fin kjole - du er total sej til lige at stykke lidt sammen! Tak Line. 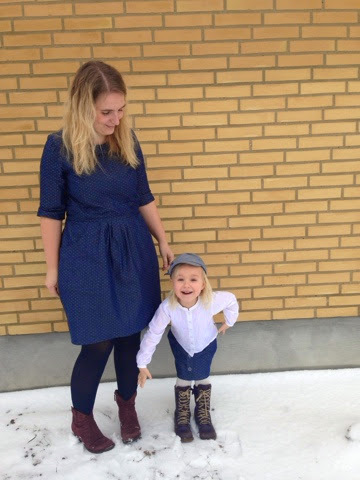 Måske skal jeg lave mor-dattertøj lidt oftere - det er ihvertfald sjovere at fotografere:) Får du syet noget babytøj? Wow, I would love to sew like you! It's amazing, I'm getting constant inspiration! I run my own clothing business and hand made clothes would be so great to have there! Aren't you thinking to sell your clothing wholesale? 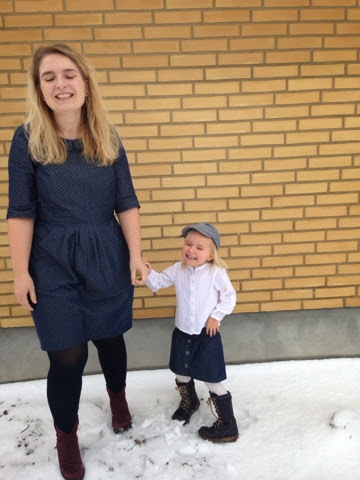 Last time I bought summer dresses wholesale, yes it was branded, high-quality and fashionable but not as unique as yours - my customers said that they don't want to buy well known branded clothes anymore as they can be seen everywhere. And I agree with them - if you ever think about selling your creations, please let me know!